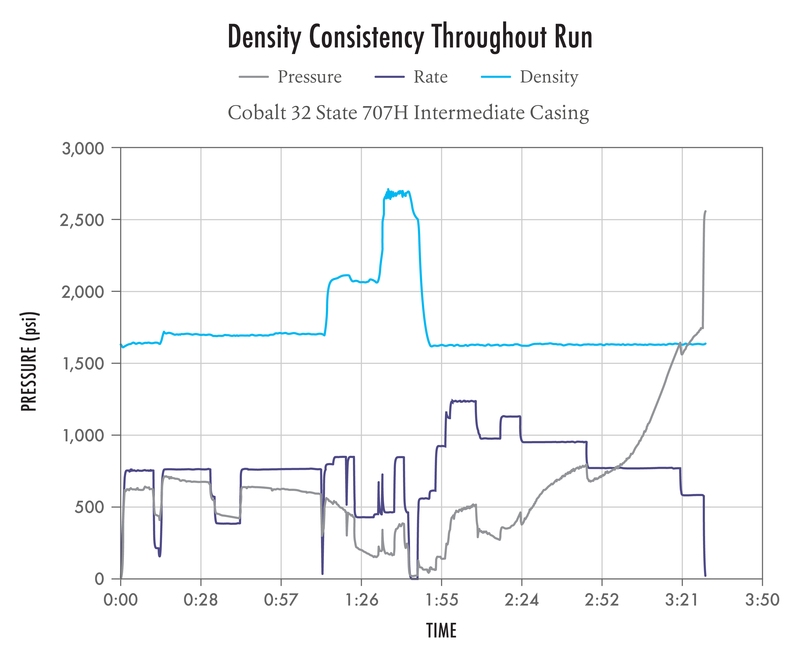 Challenge: Optimize operational efficiency by increasing the speed of cement jobs across a multitude of wells being developed in the Delaware basin. Solution: Utilize Nine’s Rapid Set 1, a cement specifically formulated to speed set times, allowing the operator to meet or exceed drill-out time expectations. Achieved compressive strength at 500 psi up to 3 hours sooner. Reducing wait time to minimum regulatory requirements. Achieving faster set times presents a prime opportunity to boost efficiency on each well, as it would allow the operator to drill out the intermediate shoe at the 8-hour regulated time, or earlier. Thus, downtime due to waiting on cement would be eliminated. The operator had been running a conventional Class H tail slurry at 15.6 ppg, which had reached 500 psi in 10-13 hours, causing a 2-3 hour wait per intermediate casing job before shoe drill-out. At a spread rate of $3,200 per hour, this was adding up. Nine innovates and breaks the 8-hour barrier. Nine’s engineering team answered the challenge by innovating the Rapid Set 1 line of cement. This cement is designed to achieve adequate thickening time and fluid properties for an intermediate tail slurry while consistently reaching 500 psi in under 8 hours by using a combination of cementitious materials and specialty additives. The first slurry tested and run on a job was at a density of 15.6 ppg, which consistently reached 500 psi in under 6 hours after a dynamic conditioning time equal to the placement time on the job, usually 2 hours. Nine continued to develop the Rapid Set 1 line, creating formulations at densities of 13.5 ppg to 14.2 ppg for formations requiring a lighter weight tail slurry, while still maintaining time to 500 psi under 8 hours. Slurries with conventional strength-enhancing additives can result in high viscosities due to the small particle size and increased surface area of the components. Rapid Set 1 solves these issues. It is designed for easy mixing on location to maintain density consistency. Nine regularly mixes and pumps these slurries at 4 to 6 bbl/min and can be mixed faster if needed. Like all Nine slurries, density control is maintained and confirmed with a Micro-Motion densometer, radioactive densometer and pressurized mud scales while mixing and pumping. Nine has successfully run over 150 jobs since the Rapid Set 1 line was introduced, saving operators approximately $8,000 in NPT per job by reducing wait on cement time by hours. 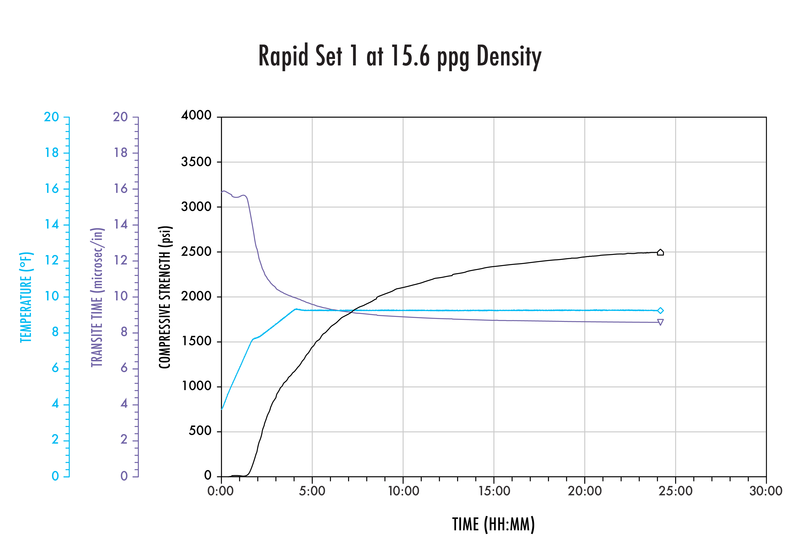 Rapid Set 1 maintains consistent density throughout the job as PSI levels increase. Uniform density allows operators to achieve successful isolations and helps to prevent short and long-term failures.